Few months ago when my little one had to take some goodies for his class, I made these Marshmallow pops for his class. I wanted to make something that could be very attractive to kids and at the same time covered and tied so that they can enjoy when they get home. After few passes on the internet, I settled on these marshmallow pops. I remembered store brought cake pop my daughter got from one of her friend's birthday and how it was covered with plastic wrap. So I decided to go with the marshmallow pops and cover them nicely so that it would be easy for Noah to hand out to his classmates. He gave me the feedback that kids loved it and he didn't forget to tell them that "My Mom made these". You can guess my satisfaction. I made the marshmallow pops few times later for my Sunday school kids and for Church, but never got the chance to take pictures. One week ago a parent of a kid from Noah's class tried to reach me. I thought it was for some birthday party invitation. I sent out an email to the Mom and she replied instantly and wanted to talk. I was perplexed, what could it be? She inquired where to buy the Marshmallow Pops that I got for Noah's class. It was the best complement that I got for Marshmallow pops. Her son kept asking her to buy those and she didn't know where to as she just got a glimpse of it before he opened the pop and ate it the day when he got it. Since she wanted to buy it for her son's upcoming birthday, she contacted me. It was a surprise to me and I was really happy to help her and show her how to make it. We made few at my house over the weekend and she loved the fact that how simple it was. 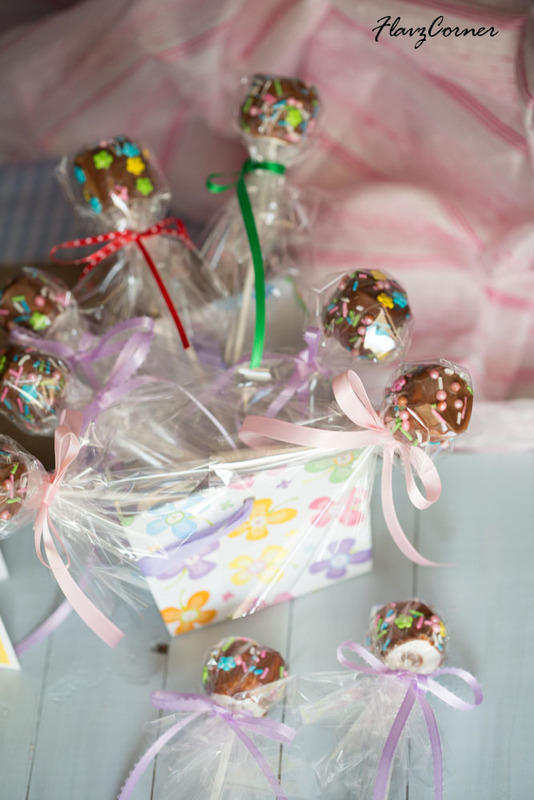 If you are planning for a birthday party or any kids event, the marshmallow pops is a great idea to surprise the kids. They will absolutely love it. So give it a try!!!! cake sprinkles with different shapes and colors. Place the chocolate chips/bars in a microwave safe bowl and melt. It takes 1 -2 minutes. Use a spoon to mix it, don't overcook the chocolate in microwave, they will burn. Or you can use a double boiler method to melt the chocolate, by placing the chocolate pieces on a steel bowl above a sauce pan with water simmering on a stove. Once the chocolate is completely melted, take a pop stick and dip the tip in warm chocolate. Insert the chocolate dipped tip of the pop stick into the bottom of a marshmallow till it reaches at least upto the center of the marshmallow. Now gently dip the marshmallow into the melted chocolate so that all sides are covered. Use a butter knife to spread the chocolate evenly around the marshmallow, by simply rotating the mashmallow dipped in the chocolate by the edge of the butter knife. No need to cover the bottom of the marshmallow with chocolate. Now sprinkle the cake sprinkles on the chocolate dipped marshmallow. Place the pop in a glass or a cup with the marshmallow sticking out of the glass and the stick at the bottom of the glass.. Repeat steps 2 - 4, to make marshmallows that can fit in one glass without touching each other. 4 of them can fit in a tall glass. 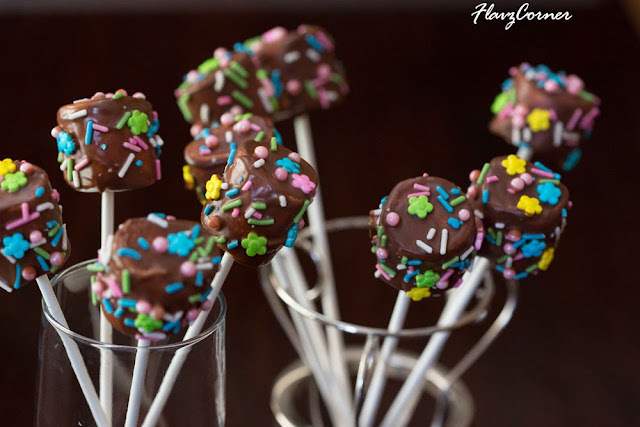 Now place this marshmallow pops in refrigerator, the chocolate will set within 5-6 minutes. Repeat steps 2 - 6 for rest of the marshmallows and the pops are ready to be covered. Cut the transparent sheets into roughly 10 cm x 10 cm square piece. Cut the sateen ribbon long enough to tie a bow knot. 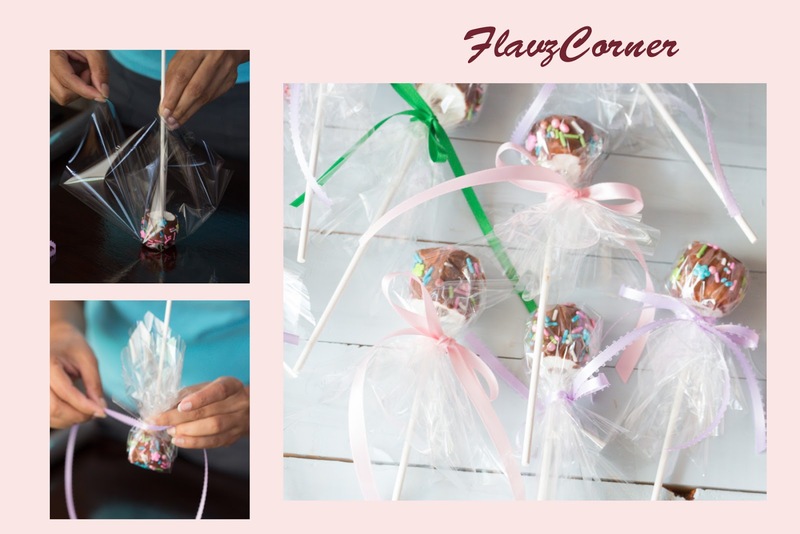 Place the marshmallow pop into the center of the transparent sheet and bring the 4 corners of the transparent sheet to the pop stick and tie the end using the sateen ribbon to make a bow knot. If using white chocolate, use the candy melts or you can use the white chocolate bars that are used for melting and coating strawberries. The white chocolate chips don't work. There is no need to refrigerate the pops. These are adorable, your little one must be so proud. This does look very professional, good job there.. Thanks Asha for the lovely comment!! These look like so much fun! I want to be a kid again! ;-) Really fun stuff - thanks. Aww these are so cute Shibi! 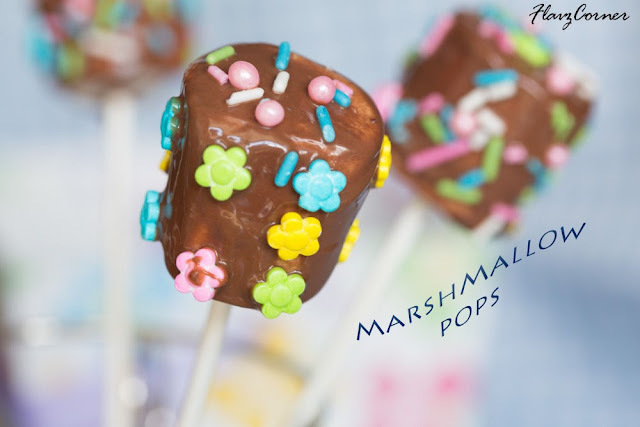 I bet my kids love to have these marshmallow pops! I so agree with u that these marshmallow pops can make kids go crazy about them. Even for our Bake sale this year someone got some marshmallow pops decorated like funny faces and my goodness that's what got over first! I love the way u've packaged them so neatly and they do look great. Haven't had a chance to stop by your space for so long, how've you been? These looks super cute...loved the way you packed them individually!